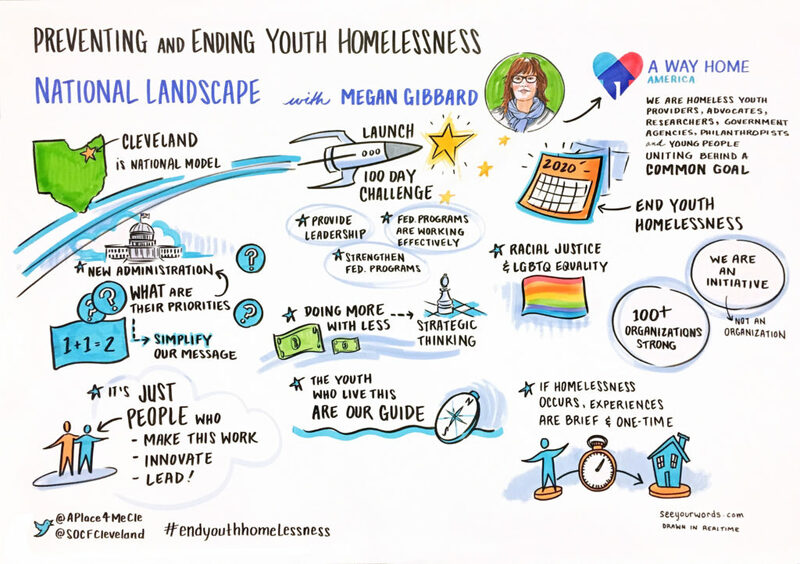 The Sisters of Charity Foundation of Cleveland recently hosted a convening of national and local partners in the work to prevent and end homelessness for young adults. The meeting took place at the Global Center for Health Innovation on January 24, 2017. The event served as the annual meeting of the A Place 4 Me initiative, and featured keynotes from Megan Gibbard of A Way Home America and Nadim Matta of the Rapid Results Institute. Celebrate the achievements made during Cleveland’s 100-Day Challenge, which housed 105 homeless young adults in 100 days. Reflect on lessons learned and ask questions of local leaders about the challenge, which applied a unique process of innovation and urgency via the Rapid Results Institute. Gain insights from youth. Four young adults shared lived experiences and essential perspectives on the work to prevent and end youth homelessness. Think beyond the 100-Day Challenge. Attendees reflected on results from the overall work of AP4M and next steps for the initiative. Help shape the agenda. Partners committed to continue to advance our community’s strategic plan to prevent and end youth homelessness by 2020. 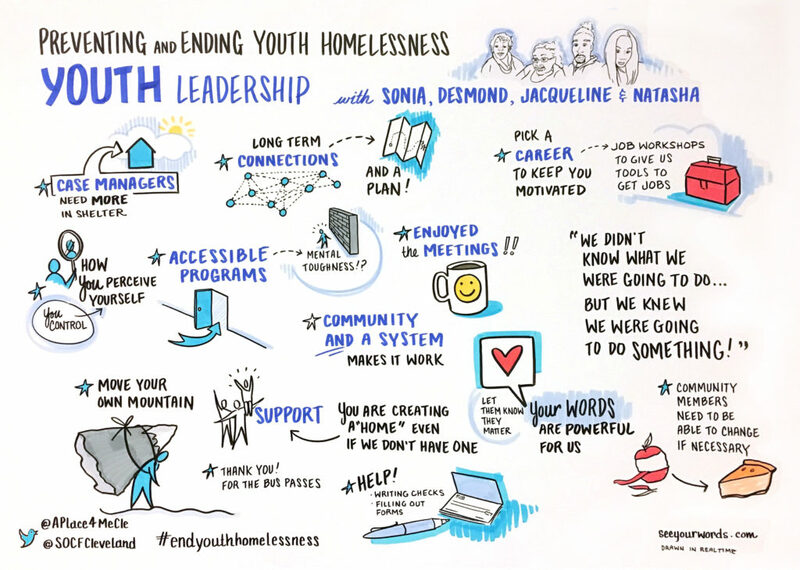 Across the nation, communities are advancing solutions to youth homelessness that prioritize: prevention, customization to developmental needs and opportunities of young people, and alignment of systems and resources for a more coordinated response. Since 2014, more than 50 organizations have come together to prevent and end youth homelessness in Cuyahoga County through the collaborative initiative A Place 4 Me (AP4M). 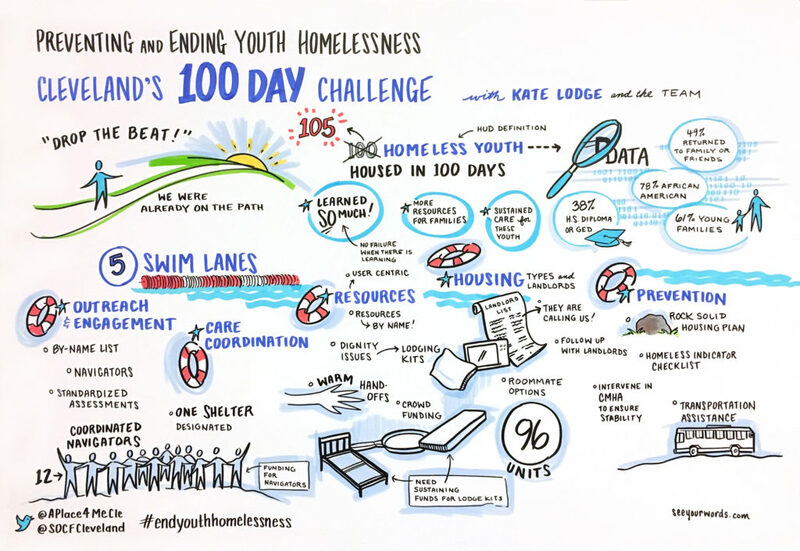 In July 2016, the initiative received national recognition as one of three communities across the country to accept a 100-Day Challenge to end youth homelessness. In September 2016, the AP4M partners launched the challenge with an ambitious goal: To house 100 homeless youth (age 18-24) in 100 days and strengthen systems to prevent homelessness for youth aging out of the foster care system. From September through December 2016, Cleveland’s 100-Day Challenge was implemented by a sub-set of AP4M. The team included dedicated professionals from: A Place 4 Me; ADAMHS Board; Bellefaire JCB; Cleveland Metropolitan School District; Cuyahoga County Division of Children and Family Services; Cuyahoga County Jobs and Family Services; Cuyahoga County Office of Homeless Services; EDEN Inc.; FrontLine Service; LGBT Community Center; Sisters of Charity Foundation of Cleveland; Two youth leaders from the community who have experienced homelessness; and YWCA Greater Cleveland. The collaborative work continues, with next steps identified to update the community-wide strategic plan to prevent and end youth homelessness by 2020. 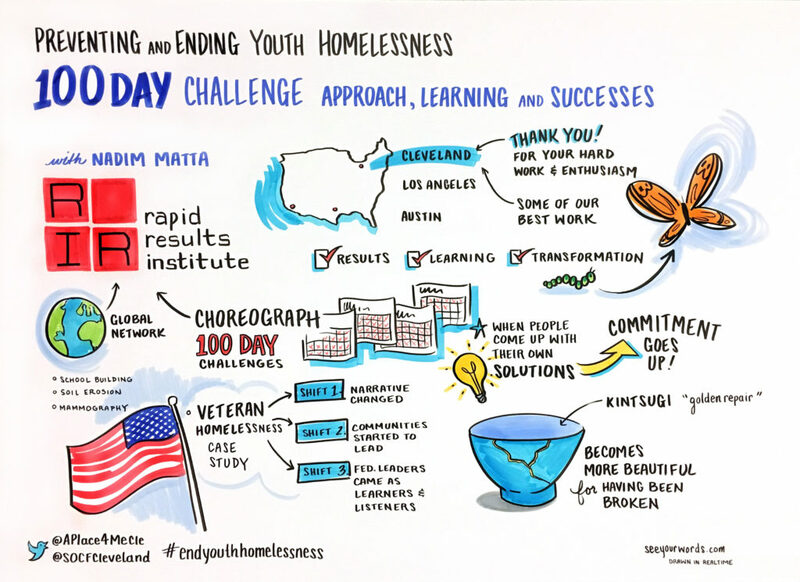 Led by A Way Home America, the 100-Day Challenges in Cleveland, Austin and Los Angeles sought to foster ambitious and innovative approaches to support youth facing homelessness. Each community has been supported in the journey by the Rapid Results Institute to rapidly innovate and test new approaches. The Cleveland/Cuyahoga County 100-Day Challenge has been led and facilitated by A Place 4 Me, an initiative that works to ensure every young person in our community has a safe and stable place to call home. The challenge builds on our community’s coordinated strategic plan to prevent and end youth homelessness, and focuses on developing and implementing partnerships to support the housing stability of youth transitioning from the foster care system.